DR. ZURIELE Gonzales Arambulo, 28, had known early in life that she wanted to care for the sick and help the underprivileged, even if it meant leaving her family to go to Mindanao. Arturo Arambulo, 62, recalled how her youngest child convinced them to allow her to serve as a barrio doctor in Cotabato City, Maguindanao. But due to a recent bombing there, Zuriele was reassigned to Santiago, Agusan del Norte on Feb. 2. Zuriele, or Doc Z or Master Zuri to her closest friends, died at 8 p.m. on Thursday, Feb. 7, in a hit-and-run incident in Santiago town. She had just arrived in Agusan when the accident happened and had yet to report for duty as a volunteer of the Doctor to the Barrios (DTTB), an initiative of the Department of Health that deploys physicians to far-flung and underserved areas. According to RMN DXBC Butuan 693, initial investigation showed that the victim got off the bus and did not notice a sports utility vehicle (SUV) speeding toward her. Zuriele came from Butuan to complete her remaining requirements for work on the day she died. On her way to the health center from Butuan, she requested the midwives to wait for her along the highway. But while waiting for Zuriele, an emergency delivery had sent the midwives running back to the health center. “When she got off the bus, she crossed the street and she was already on the edge of the road, the speeding SUV’s side mirror hit her backpack. ‘Dun yung time na umikot siya at pumunta sa ilalim ng sasakyan at tumilapon siya (The impact sent her body spinning and she ended up under the vehicle before being thrown off),” he added. Arturo said that since Zuriele was a child, she had always dreamed of being able to heal the sick. She finished BS Biology at the University of the Philippines Los Baños and worked as a call center agent in Manila for a year before exploring her options in medicine. A native of Cainta, Rizal, Zuriele went around the country to look for a medical school, and decided on a university in Baguio City as her top choice. Just before leaving for Baguio, she heard about the Cebu Institute of Medicine (CIM) and decided to come to Cebu instead. She graduated from CIM in 2017. Although a bit hesitant, Zuriele’s family supported her ambition to serve the poor. “She decided she wanted to be a DTTB. She applied, had her interview and passed. Then they were asked to choose where they will serve. And since no one wanted to go to Shariff Aguak, that’s what she chose. I told her, ‘Please don’t go there, there can be trouble there.’ And she replied, ‘Who will come here, papa? I pity the people here, they don’t know what to do when they get sick. Should they just close their eyes and wait to die?’” he quoted Zuriele as saying in Tagalog. Barely three days after she arrived in Shariff Aguak, Zuriele was pulled out due to the bombings in some areas in Mindanao. She chose to be assigned in Santiago town in Agusan this time. “I told her, go. If that’s what you want, there’s nothing I can do,” Arturo said. The last time Arturo saw his daughter was on Feb. 2, Saturday, when he sent her off at the airport to go to Butuan. 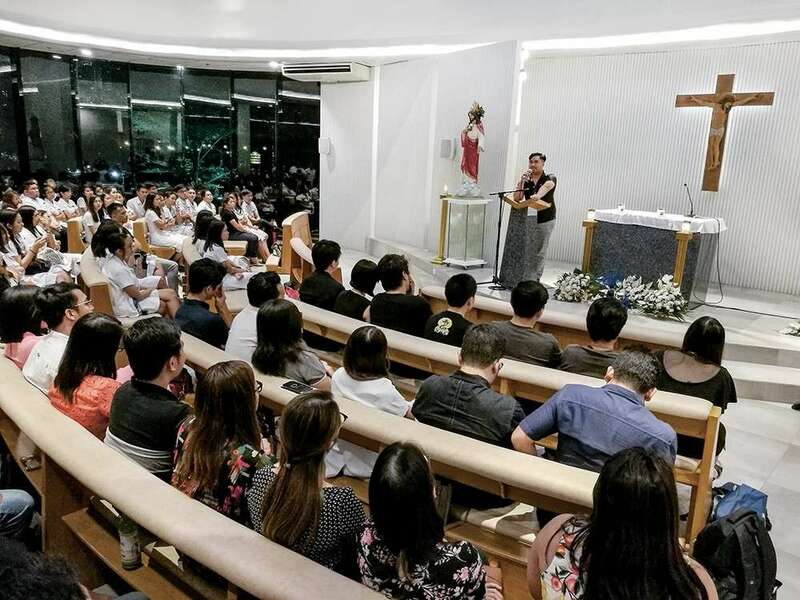 In Cebu, Zuriele’s fellow members at the Alpha Mu Sigma Phi relived her memory during a tribute mass offered at the Divine Mercy Chapel at the CIM on Friday, Feb. 8. Alpha Mu Sigma Phi is an organization in CIM founded in 1959, which aims to render voluntary medical services in the event of epidemics, state of calamity or chaos. “Cebu is a place far from her home but look at this, a lot of people are here for her. In her short life she was able to gather this huge crowd. Her life was never a failure because she touched a lot of lives,” she said. “She kept telling us that she likes the assignment in Mindanao because the people there need a doctor. So maybe let’s just see her as an inspiration. We are given a chance to serve now and be a physician with a heart, let’s always bring her in our being a physician,” Rosello added. As of Sunday, Feb. 10, the Arambulo family was still waiting for updates on the Santiago police’s investigation. “They have leads but they are stilling checking footage from the CCTV. If I see the suspect, I would like to ask the driver a lot of questions... why did he or she have to drive so fast?” the grieving father said. Zuriel’s remains will be laid to rest at the Heaven’s Gate Memorial Garden II in Antipolo City on Wednesday, Feb. 13. “We know she’s now in heaven and she’s happy. I love her so much. I hope she will guide us and I hope she waits for me,” Arturo said.